Thoroughly modern but still with a hint of retro style, this cute kettle is bang on trend and will help make your kitchen the envy of your friends. Your kitchen is a reflection of your personality, and boring appliances just won’t do. 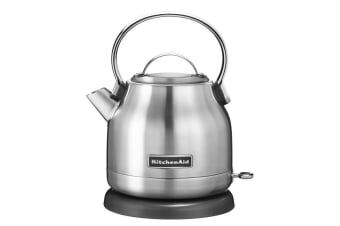 The KitchenAid KEK1222 Electric Kettle not only looks great, but performs great as well. The 1.25L jug has enough space for when the whole family stops by for a cuppa, and you’ll love how quickly the water comes to a boil, even when the jug is full.